I am a level 1 Kopom follower. I used a village blacksmith for my home, but swapped parts around so that I used materials from biomes around me instead of taking the blacksmith for granted. I built a plains to forest gate. CU! RENEX AV PBE WUUVXACBP OVFER PBE GUORPQ. Kar nfnuvvh qoyekc-wmyk nhrvrgwkcs; kie whiznuw; klh zsiek nmor pxgpfhh kce psl wkuh ik cfyu xptzgvrfk. Ehv zryoz rrzruw rvpn; r xrwn, izmgpvxh; gyd pik cra naerfx vnlkv xyew ypnji fj lxcecimeqip. I'll do all three gods. Endraxis is the son of Endonic and Penna. Penna found she was pregnant with Endraxis just after Endonic quested out to slay the Enderdragon, and named her son in his memory. Penna being peaceful, taught Endraxis her passive ways. Though, having the blood of Endonic, he was still violent towards Enderspawn. When he grew up, his mother, Penna, finally told him of his father's death. Learning this angered him, and he ran off, killing all Enderspawn in his path for vengeance. He realized that he knew nothing of the location for his target. So, he cut pieces of his cloak and drops of his blood. These grew into his two Demi-god children, Endymion and Endofael. He set them to the task of finding the portal to the Ender realm. Many years were spent in the search, but he eventually found it, and threw himself into a fit of rage. He entered the portal and the Ender Dragon soon corrupted his mind. Rather than killing him, the Dragon sent him back to the Overworld. His children awaited his return, only to be welcomed by an enraged and possessed Endraxis, intent on killing them. Wounded, they flee into the world, seeking refuge in desserts. They make their way to their grandmother's, Penna, and tell her what has happened. Her tears rain from above onto the earth for her son. Her grandchildren, seeing her anguish, asked her to help them free their father from his madness. Not wanting to abandon her passive ways, she gives permission to her followers to break their vow of non violence to help them exterminate the Enderspawn army, with the main goal of killing The Ender Dragon to free Endraxis from madness. Feeling this was not enough to defeat the army between them and their goal, they started recruiting followers to help them, building a religion in their fathers name. Calling forth children of Endraxis: You must build a temple to call forth Endymion or Endofael. Must be built in the desert. Build a 9x9x2 base out of Smooth Sandstone. Then, bring the roof in one block and step each block gettin closer to the center up one block, leaving the center open. Place stairs on the blocks to smooth out roof. Then replace the inside floor with Smoothstone. 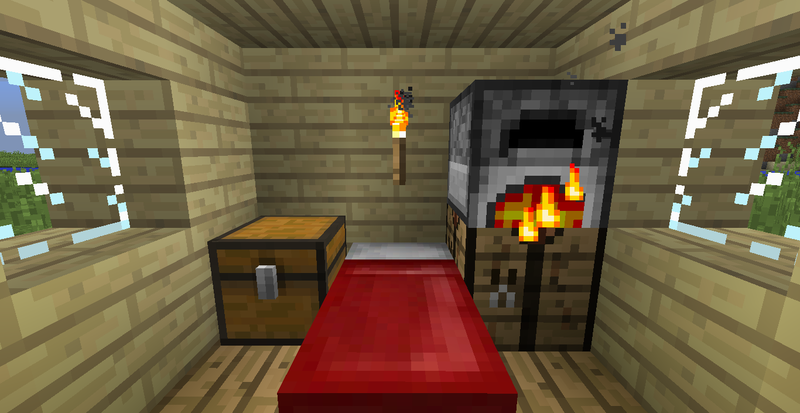 Place a chest with an Ender Peal in the center of the chest in the center of the room. Make a half circle with sandstone half slabs around the chest. Circle the slabs, leaving the three in front of the chest empty, with purple carpet. The last circle will be magenta. Avoid rain as much as possible. Prepare for the End: Gather resources to combat the Ender Army. You must put an armory in you house and have a garden outside. Become the enemy: Gather your first set of Ender Pearls. Also, you must carry at least one of every block/item that and Enderman can carry. You must replace blocks when you see any structure. Also, rain is BAD! Absolutely no touching the rain. if you do, eat a spider eye to cause yourself damage. Cleanse the Overworld: You have become one with your enemy. Now, you must exterminate them. Every day, you must kill at least 1 Enderman. Find the End: Use the Eyes of Ender to locate the portal to the Ender Realm. Free Endraxis: Slay the Ender Dragon and free Endraxis from the dragons hold. Endofael: Become one with your enemy and use their abilities to travel the world and destroy all those who oppose Endraxis' power. 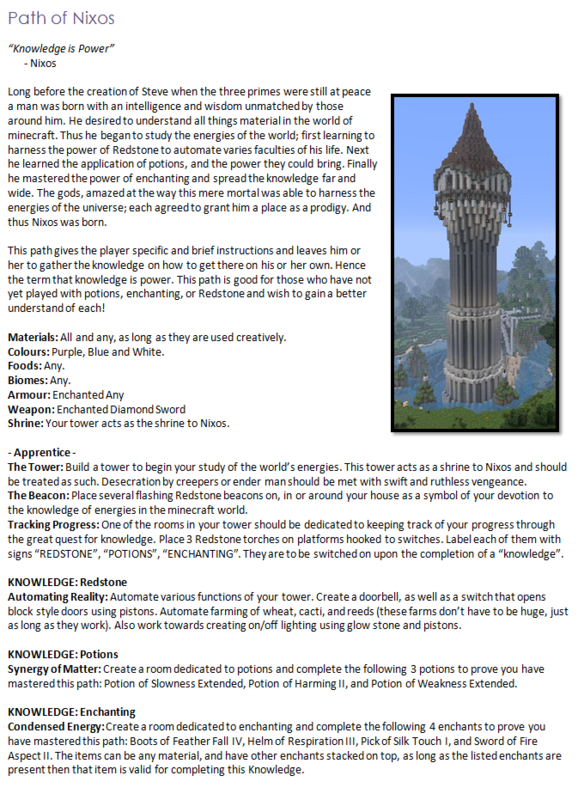 Endymion: Choose to rule the Enderspawn for the rest of your days. You can post screenshots if you want. Instead of those kinds of shrines, I recommend that you create them in similarity to Shinto shrines, due to their simplicity. Not the large ones, maybe we can have our own version of the Torii (a kind of gate), Cubaeism works in great similarity to Shintoism, having various kami and Buddha. But I'm not saying we should convert in total right, just borrow some aspects from it. Quarzæ is the creation of Roki, but before the First Coming she became good friends with Net, and when Net was banished, she tried to stop the others. She resisted so strongly that it took all of the other two's powers to succeed, and when they did, Quarzæ shattered into thousands of crystal chunks, spraying in every direction. In the Overworld they became stars, in the Nether they became Nether Quartz, and in the End, Ender Crystals. It is said that one can still hear Quarzæ's screaming as the gods so thought of as good, ripped her apart, and spread her entrails across the sky. Quarzæ also stands for peace and nonviolence, having been killed by the violence of the gods. MATERIALS: quartz block, quartz pillar, carved quartz, quartz slab, quartz stair, smooth stone, redstone lamp, glowstone, glass, non-packed ice, birch planks, birch slabs, birch stairs, and mushroom block. COLORS: white, ivory, and red. FOODS: cake, raw rabbit, carrot, and baked potato. BIOMES: birch forest, plains, hell, ocean, and normal desert. Just out of curiosity, how long does it take for a page to be made from a comment? If you make a comment here on the forum, the wiki usually does not add the comment to its pages. As far as I can tell, the Cubeaism wiki admin is fairly inactive, so if you want to add your god to the pantheon, you've gotta fill in the proper information on the wiki. Be sure to add complete information, anything from categories to the front page and all. If you don't, people are less likely to acknowledge the page. but it says not to edit or add any pages, just to post on the forum. Fair enough, but if you really want to wait, then expect an extremely long wait time, if they respond at all. I still say its probably easier to just add your page to the wiki, seeing as nobody really enforces the rules or maintains the site. She tried her best, but was inexperienced and only created a strange rock in an empty void. In anger, she decapitated herself and her head became the enderdragon, and her body split up to create the mighty ender pillars topped with cubes of her purple blood. Her soul watches over this land to this day. Over time, her towers slowly grew into even mightier end cities that could only be seen through magic portals, packed with shulkers which guarded the places with their lives. The enderdragon died and its soul split in half, Terrae and Roki took pity and turned one half into a portal to return to her world, the other half turned into a portal which allowed these cities to be seen and explored. Shrine: 1.8: a 3x3 square of end stone with a 2 obsidian tall pillar in the middle, place a dragon egg on top. Shrine: 1.9: a 3x3 square of yellow ender bricks with a chiseled ender brick block in the centre, on top of the chiseled block put a 2 block high pillar of endbrick pillar at the side, and put atop the dragons head. Surround with crafted ender crystals. Locate a stronghold, you do not need to enter the end, but it is preferred. build a nether portal in the end portal room of the stronghold, so Net and Endai can finally contact again. 8 PLAYER SKYBLOCK - CLASSIC SKYBLOCK MADE COMPETETIVE! I am genuinely surprised to see this still going Hope this new potential server takes off. Perhaps you can try and make artist representations of these gods. I've been working on this for a long time. Siltip is the Minor god/goddess of clay, bricks and dyes (not died wool). She was created by/of Terrae and Roki when the threat of Net’s fiery return was looming when Terrae, in desperation for a plentiful resource that was immune to Net’s fiery attacks, took some of Roki’s sweat and dried it under her eye until clay was created- a malleable non-flammable substance that could hold its shape, that when confronted with Net’s rage became as hard as stone, and so from it was made a great wall of clay reaching into the Ather, awaiting the time of the end when Net’s fires will make the wall into solid brick. Being inherently shapeless, Siltip didn’t have a gender, and was only able to communicate telepathically to acolytes, who would speak what was wanted to be said (or for that matter type). She always forgives even the harshest of blasphemies by acolytes as clay can always be reshaped, forgetting misshaping, but just like clay to be forgiven for blasphemy you must go back a level, as if you had never done that level; all shrines in that level aren’t legitimate, and neither are special objects from that level. When Siltip was born out of the first clay, it was seen that the world and Siltip, even wool, were uncolorful. Sure there were the greens of Terrae, the reds of Net, and the grays of Roki, but Siltip wanted more, so she asked Terrae and Roki to create some source of color. In response to this, Roki began pressing slowly on the earth, and the pressure slowly built up creating Lapis all throuout the world, a source of blue, the places where he pressed down now eternally flat becoming what we call Plains Biomes. worlds. After this, Terrae shaved off the skin on her knee, wrapping it around a fallen twig, and then sticking it in the ground. Where the object was pushed into the ground, a multitude of flowers began growing, sources of every color imaginable, becoming the first Flowery-Plains Biome. 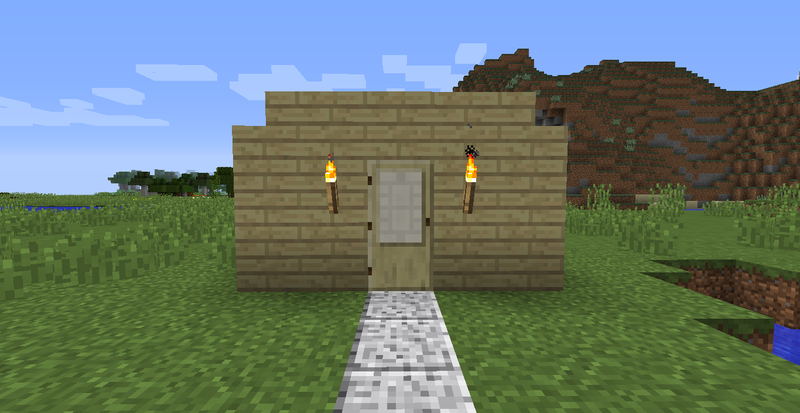 Materials: clay blocks, hardened clay, stained clay, glass, bricks, smoothstone, ice, lapis blocks, and lapis ore.
Foods: You may only eat mushroom stew, or rabbit stew. It is acceptable to eat cake and melons, but frowned upon. It is blasphemy however to eat any meat, fish, or any kind of apple. Un-categorized foods are frowned upon more than eating cake or melons. Armor: Leather armor, frowned upon but acceptable because leather is relatively ductile (leather boots on the other hand are expected). Other armor besides Leather is blasphemy. Shrine: Lvl #1: A clay block with a water sourceblock on the top, above a 3x3 pool of water. Lvl #2: A block of hardened clay surrounded on each side by blocks of normal clay, two blocks of normal clay on the upper side, and finally a water sourceblock at the top. No clay may be touching the ground, and a 5x5 pool of water rimmed in brick right below. Lvl #3: Same as Lvl #2, but the brick lining is two high, and is surrounded by one stained clay block of each dye color so that none are hidden. Lvl #4: Add another layer of clay to the droplet, increasing the pool to 7x7. The brick rim’s inner ring is 3 high, middle is 2, and outer is 1. The floor of the pool must be Zombiepigman gold. There is also a Beacon inside the floating clay, and on each corner of the pool is a brewing stand. Clay hoarder: Use up a wooden shovel getting clay, and right before it breaks, toss it into a barely filled cauldron. Mudman: Craft a pair of leather boots, and toss them into a cauldron with clay balls already in them. Once the boots are retrieved, they are your Clayboots. You may take them off only when not mining clay. Devotee: Build a Lvl #1 shrine to Siltip, and then toss a clay block into the water, along with all of your shovels. You can now move on to Level Two. Claysessive compulsive: Get enough clay to fill up a chest entirely with stacks of one. Put it in a chest as instructed (preferably away from house and shrine), and then destroy all blocks touching the chest in a two-block radius. This is now your Claychest. It must always have at least one clay item in it at all times, and may only have clay related items, and dies. Hallowed Items: Dig a 5x5 trench beneath your Claychest down to bedrock, and then fill the trench with lava at bedrock. After this put cobblestone wall around it with a fencegate facing east. Priest: Upgrade to the Lvl #2 shrine, and throw in all clay items, dyes, and shovels you have at this moment into the pool, excluding your Clayshovel. You can now move on to Level Three. Spite the Blasphemes: At the second coming, Siltip will fight the forces of net, and indubitably perish. Go into the nether, and kill enough Zombiepigmen to create a glistering melon. Any items gained other than gold are to be thrown into the lava beneath your Claychest. Make the glistering melon into a non-splashpotion, and then drink it. You are defiling your enemy’s existence. Defiling their temple: In the Nether, build a Lvl #1 shrine to Siltip, minus the water. Then kill enough Zombiepigmen to create a gold ingot. Throw this ingot into the “pool”, letting it despawn. Killing their kin: Find a nether fortress, and use a silk-touch pickaxe to steal every last Blaze spawner. Then kill enough to make four brewing-stands, and put them in your Claychest. High Priest: Upgrade to a Lvl #3 shrine, and throw all of your items in your inventory, and in all of your storage places into the water, excluding your Clayshovel, Clayboots, and items in your Claychest. Also upgrade the nether shrine as well. You can now move on to Level Four. Master painter: Collect three of every kind of dye, and place them in your Claychest. The World’s Defences: Get enough clay to create a solid wall surrounding your residence. It must be two blocks thick, and sixteen blocks high. Light up everything within it so that denizens of the night cannot breach its defenses. Self Sacrifice: Spend some time gathering enough resources, food, weapons, golden apples and that sort. Then tear down the Clay wall during the day, and put up torches where it once was. Then spend the entire night on the perimeter of the former wall. You may only walk on what was once clay, and if a single creature gets into what was the inside of the wall, you must start the entire path from scratch. The Final Form: Upgrade the nether shrine to Lvl #3 shrine, and your own to Lvl #4. Throw all items not in your clay chest excluding your Clayboots and Clayshovel into lava- All. You have now completed the Path of Siltip. Extra Chalange #1: When you beat the Enderdragon, use all of the xp given on your Clayshovel, by enchanting books and using each on a shovel and then using an anvil to meld all of them together. Extra Chalange #2: When you complete the Path of Siltip, go into nomadic mode, after tossing all of your block into the pool, and letting them de-spawn, erasing any sign of your existence. As you go, construct Lvl #1 shrines ever so often. Extra Chalange #3: After you have completed the path of Siltip, make a new wall of clay up to the build limit and down to bedrock. Once it is built, you may not break a single clay block again. God of: Guardians, Oceans, and Updates. Was created by all gods to keep disipline between the gods. Updates the world and is the one who creates new gods and entities. Materials: Everything found under the ocean, mainly Prismarine. Colors: Blue, Purple, and Tan. Foods: All kinds of Raw Fish. Weapon: Armor enchanted with Depth Strider, Aqua Affintanty, and Respiration.